The resonant frequency and bandwidth of ultrasonic transducers are selected from the PZT-5A piezoelectric ceramic disc polarized in the thickness direction as the transducer, and the radius R of the piezoelectric ceramic disc is 6mm and has a thickness h. The height of the outer surface of the inner cavity is R, the radius R of the inner cavity is about 5 mm, the radius of the top surface is RZ=1. 5 mm, and the height of the inner cavity is H=0. 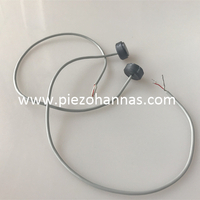 5mm, the axial resonance frequency of the transducer can be expressed as the other parameters are unchanged, and only the thickness hl of the thin shell is changed. Then, the axial resonance frequency is linear with the thin shell thickness hl, in order to obtain each a ultrasonic flowmeter transducer of different resonant frequencies can be first stamped and formed from a high-elastic bronze strip having a thickness of 0.35 mm, and then the thickness hl of the thin shell is changed by manual grinding to make the axial resonance of the transducer The frequencies of 26 kHz, 27 kHz, 28 kHz and 29 kHz indicate that this manual grinding method is feasible for the prototyping phase of the prototype, but it is not suitable for mass production. The combined structure combined transducer is a disk transducer as a main transducer for transmitting and receiving ultrasonic signals with a certain bandwidth; a bandwidth of about 1 kHz (emission state) and a center resonance frequency of 26 kHz, 27 kHz, 28 kHz and 29 kHz .Cymbal transducers act as auxiliary receivers for receiving Doppler echo signals. 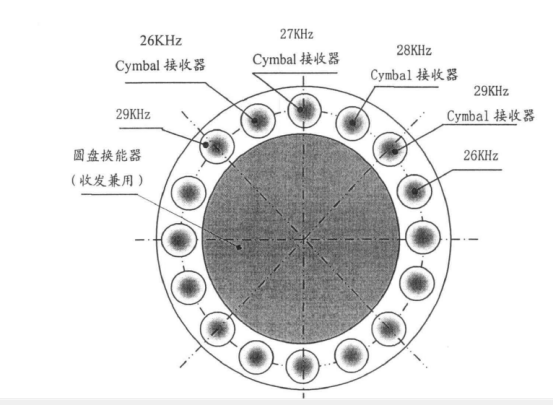 In order to improve the sensitivity of the auxiliary receiver transducers are evenly distributed over a circumference of 100 mm radius, staggered at four different resonant frequencies as with the main transducer on both ends of the transducer. Appropriate acoustic matching layers and backing materials should be applied. The working principle of the combined ultrasonic sensor for fuel tank is to excite the disc transducer with a central frequency of 23. 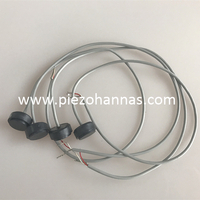 5 kHz high-voltage pulse signal, so that it transmits ultrasonic waves outward, and the main and auxiliary transducers jointly receive the echo signals generated by the target. . Since the combined frequency band of the combined transducer is a superposition of the primary and secondary transducer bands, it can receive an echo signal of 22-29. 5 kHz. When the measuring target is stationary or the moving speed is slow, the frequency of the echo signal will fall within the working frequency band of the main transducer, when the auxiliary transducer does not work; and when the measuring target moves at a higher speed ,At the time, due to the doppler effect, the frequency band of the echo signal may fall outside the frequency band of the main transducer. 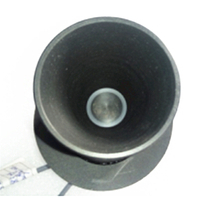 At this time, the auxiliary transducer functions as a “pick-up” to receive echoes that the main transducer cannot perceive. 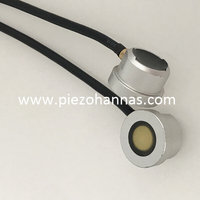 In fact, the ultrasonic oil level sensor is not only highly sensitive in the receiving state, but also has a bandwidth greater than that in the transmitting state. 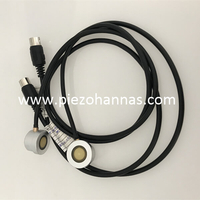 Thus, even if the static target is measured, the transducer still has a small amount of charge output, which is beneficial for improving sensitivity of the combined transducer.